What would you do if you have a motorcycle and only two days in Tokyo, Japan? Keep in mind that there's tons of wonderful things to eat, sightsee and shop! Well, that short amount of time is definitely not enough for me, but I've gotta make the most out of this impromptu ride trip! By trying to squeeze as many things to do within the next 48 hours before I fly to Kuala Lumpur for World Superbike race @ Sepang with Pirelli. Day one on my own with the KTM 690 Duke (special thanks to KTM Japan) saw a really gloomy start. Weather wasn't playing nice. No sky, no mountain in view, strong winds, and rain. Just look at my un-enthusiastic face there. LOL. So starting from Lake Yamanakako, the plan for today was to visit the 5 Fuji Lakes which are the most popular spots for viewing Japan's tallest active volcano, Mount Fuji. 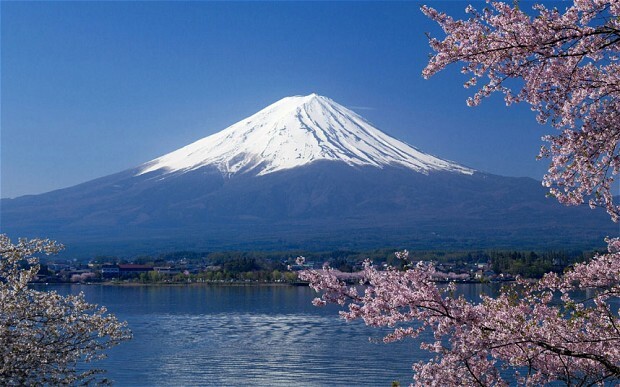 富士山 (Fujisan) stands at 3,776m above sea level and is Japan's tallest active volcano. Lake Yamanakako is the largest lake among the 5 Fuji Lakes, and also the highest in terms of surface elevation. Yet it is also the most shallow one, with only a water depth of 13.5 metres. The Lake was formed during an early eruption of Mt. Fuji, and was drained by the Sagami River. But with such heavy fog blanketing the skies, I know.. there was little chance of catching a glimpse of Mount Fuji. 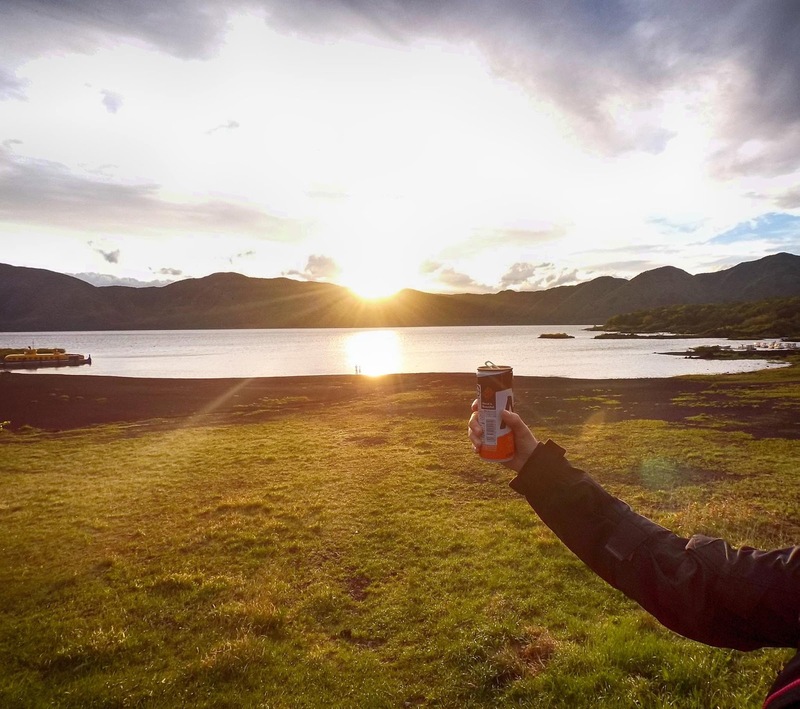 Weather plays a huge role when it comes to sightseeing. 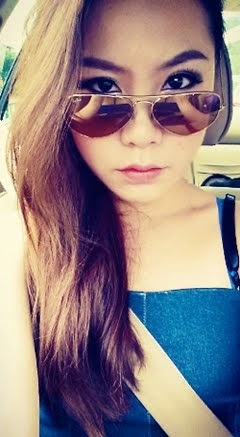 Everything looks vibrant and beautiful when it's sunny blue skies. But the minute it's rainy and cloudy, everything is just GREY. 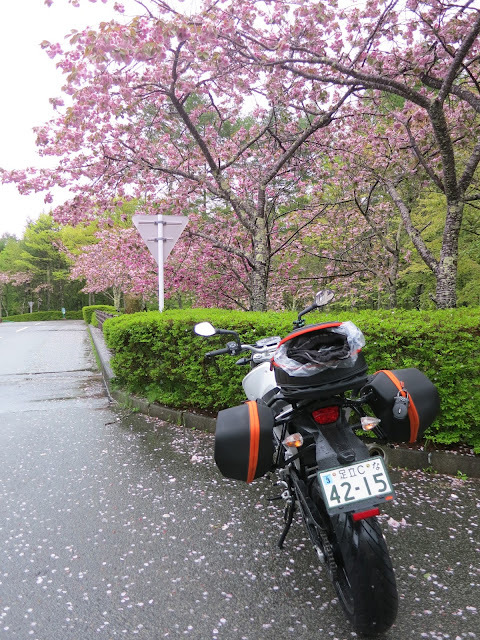 Thankfully, I caught up with the Sakura season (cherry blossom) that totally lifted the dampening mood! I didn't expect to be able to see it because according to forecasts, by mid April, it was already over. And we are now in May. According to Japan's Cherry Blossom Forecast guide, the Sakura season in Tokyo lasted only from end of March to the start of April. If you didn't know, cherry blossom usually lasts up to only 14 days with average Spring weather, but can be cut short from excessive rain or heat. But here I am, so blessed to be standing under endless rows of beautiful Sakura with their petals gently falling all around me. I wanted to collect ALL the Sakura that fell to the ground, put them in a box, and bring it back to Singapore to show my friends and family how pretty pink they were. But I think even before I board the plane, they'd all turn brown. So instead, I took a thousand picture of em, to remember how lovely this moment is. 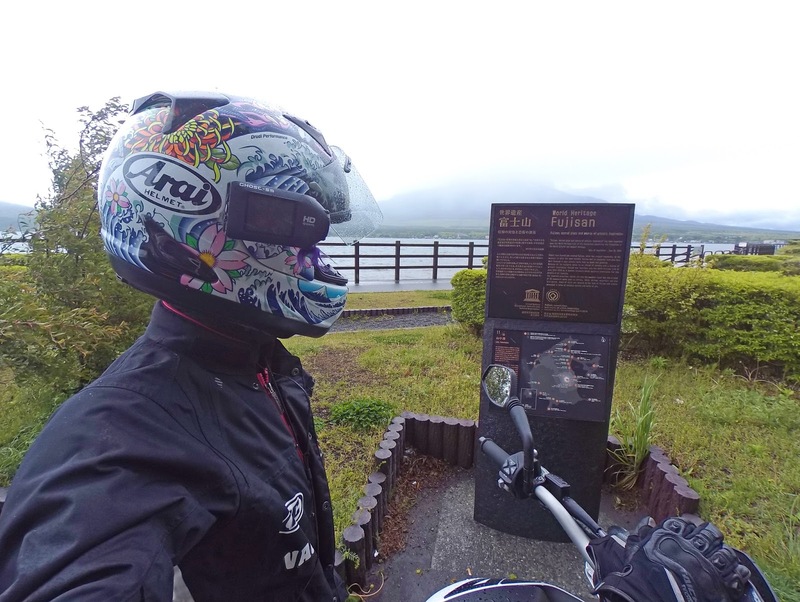 Time to head onto the next lake, Lake Kawaguchiko, that was a short 18KM away via Route 139. 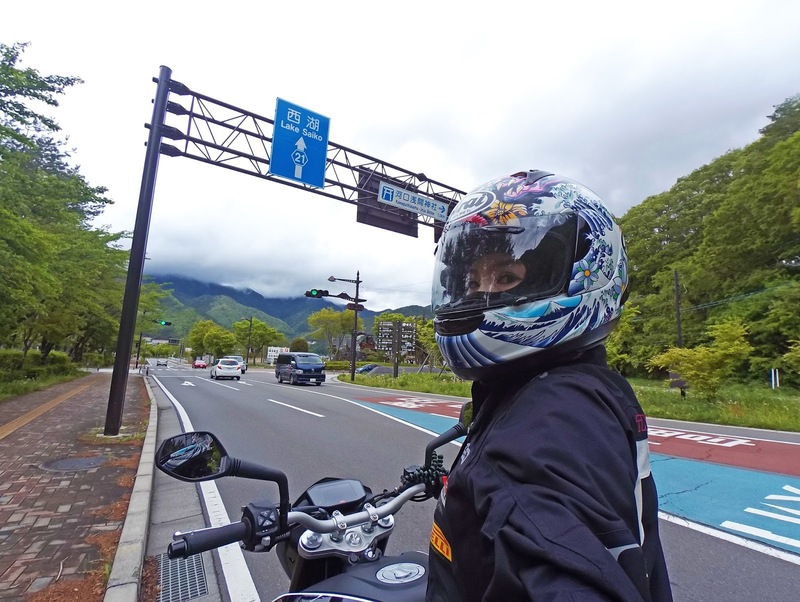 Road tolls in Japan is a little on the high side, so if you can skip toll roads, try to do so as normally the alternative non-toll roads are a breeze to travel on, except for occasional heavy traffic. On the way to Kawaguchiko, I managed to catch a short glimpse of Mt. Fuji but it was soon quickly covered by the heavy fog again. 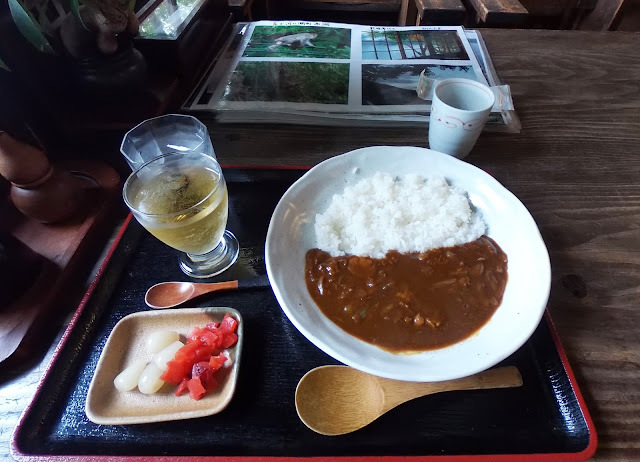 Arrived at Kawaguchiko, a more popular town among tourists and checked into Koe House (2,500 Yen/night) which I found on AirBnb. It's located right opposite Kawaguchiko Train Station, and 5 minutes from Lake Kawaguchiko so it was easy to find. Chose the Tatami-styled room and because it was off peak season, I got to enjoy the whole place to myself! 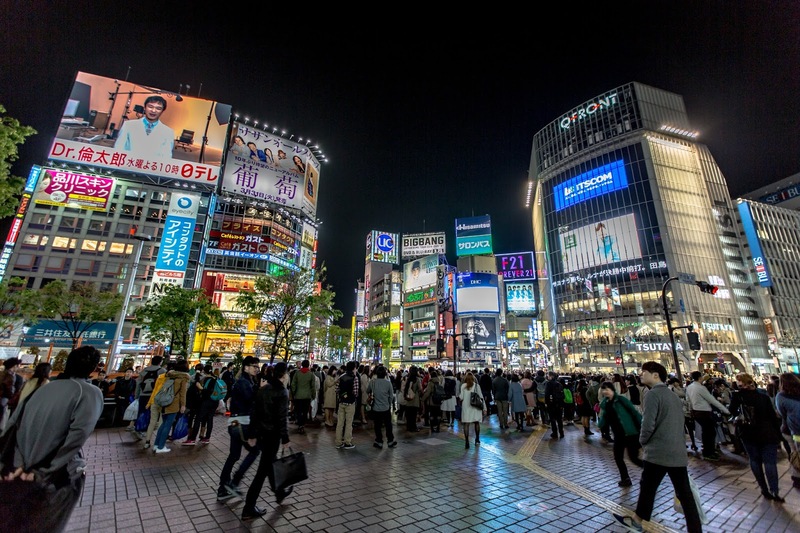 Why Hostels Over Hotels In Japan? The superb thing about hostels or guesthouses in Japan is that they're extremely clean and tidy, thanks to their high standards of cleanliness. Hotels in Japan can be expensive, especially in the city, so opting for hostels is the next best alternative. 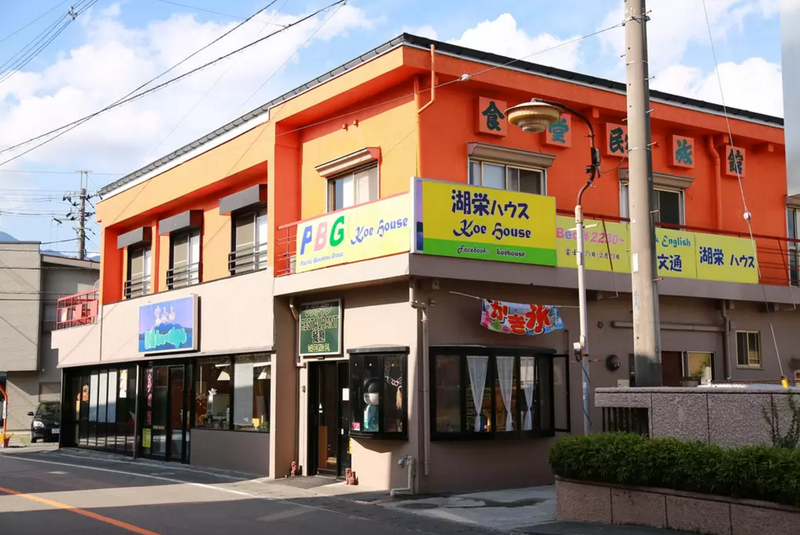 Besides, many of the hostels have very good showering facilities, male/female rooms separated on different floors for privacy, and some even have onsen (hot spring) facility! 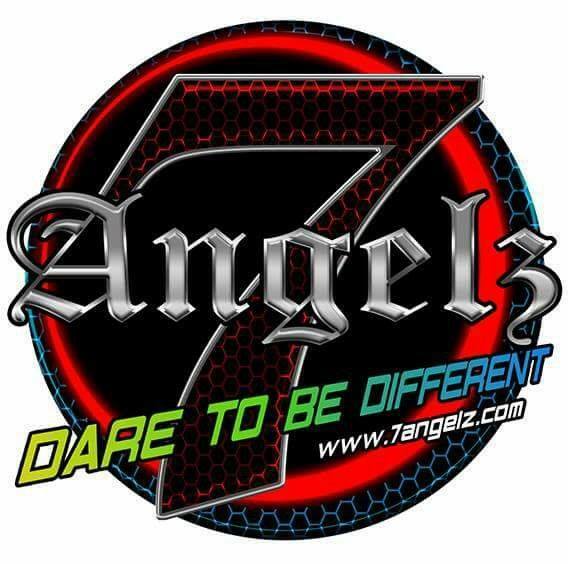 It's also a great place to meet other travelers from all over the world. Unloaded my side panniers filled with my baggage and continued the ride onto Lake Saiko. 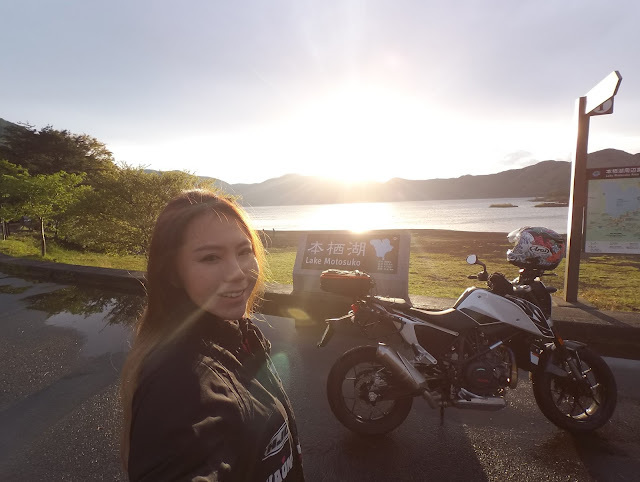 Had my senses soothed as I cruised gently along Lake Saiko with the KTM 690 Duke, before dark clouds and strong winds started approaching in. Better look for shelter soon, and get something to fill my rumbling tummy. Stumbled upon this little Japanese cafe along the road that overlooks Lake Saiko and there was a friendly old lady at the entrance, signalling me in to come in as the rain was approaching in fast. It was cosy and warm inside, as I removed my gears and went like "Ah...., shiok" while stoning at the tranquil Lake Saiko right next to me. Stoned for about 5 minutes before I went through the menu on what to eat. Oh great, it's all in Japanese and there's no pictures LOL. I can't read Japppp. Used my really lousy Japanese to finally let the old lady know what I wanted. Gulped everything down within minutes cuz I was so hungry. 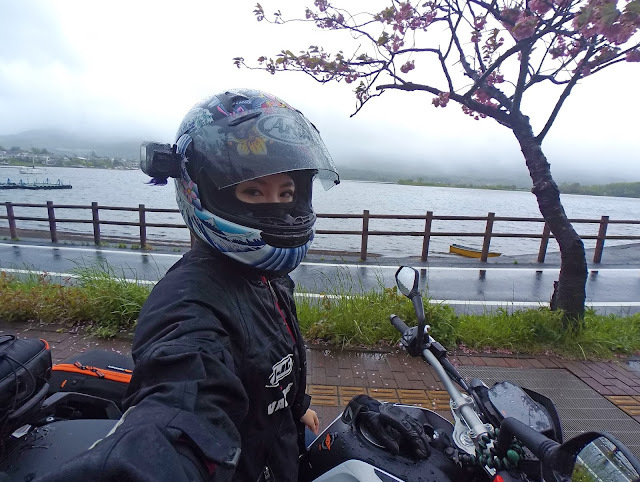 With my tummy satisfied and the rain reducing to a light drizzle, I thanked the old lady for her warm hospitality and continued the ride onto Lake Shoji. 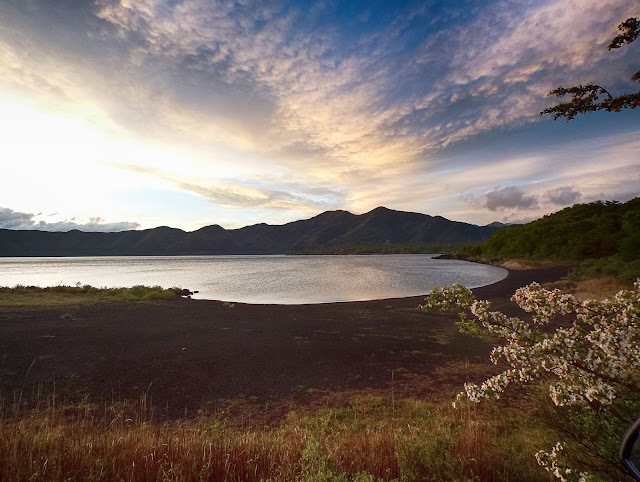 Lake Shoji is the smallest lake among the 5 Fuji Lakes, and shares the same elevation with Lake Saiko and Lake Motosuko, which confirms that these three lakes used to be one, but was divided by a huge amount of lava flow from Mt. Fuji during one of its eruption. It'll be much more enjoyable to be here during Summer with sunny days and blue skies, where visitors would fill the campsites nearby and canoe out onto the lake. 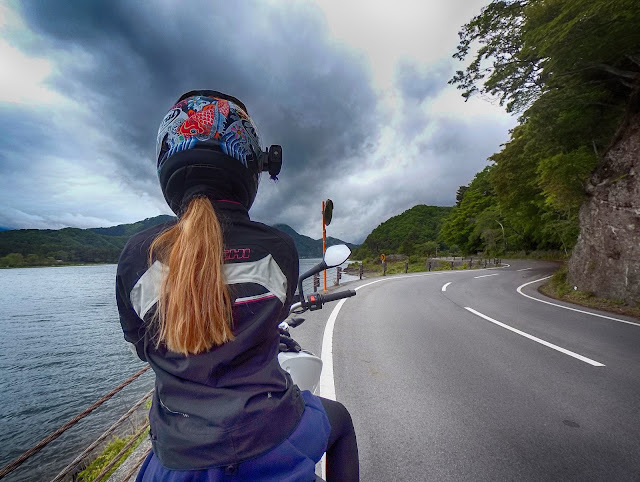 Moving onto the last of the 5 Fuji lakes, Lake Motosuko. Lake Motosuko is the deepest lake among the rest, with a maximum water depth of 121.6 metres. Sport fishing is a popular activity here during Summer. What's cool is that according to Wikipedia, this lake and its view of Mt. Fuji were actually featured on the Series D of the Japanese 5000 Yen note! 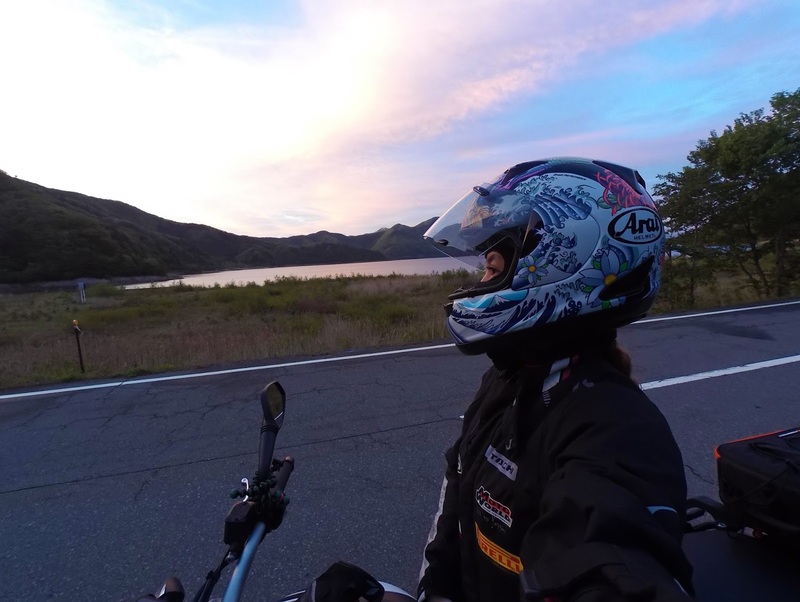 Thankfully, the skies cleared up and a gorgeous sunset revealed when I arrived at Lake Motosuko. Watching the soft sunset with the KTM 690 Duke has never felt more romantic.... hahaha. If you don't already know, sunsets are my favourite time of the day :) because they're so calming. 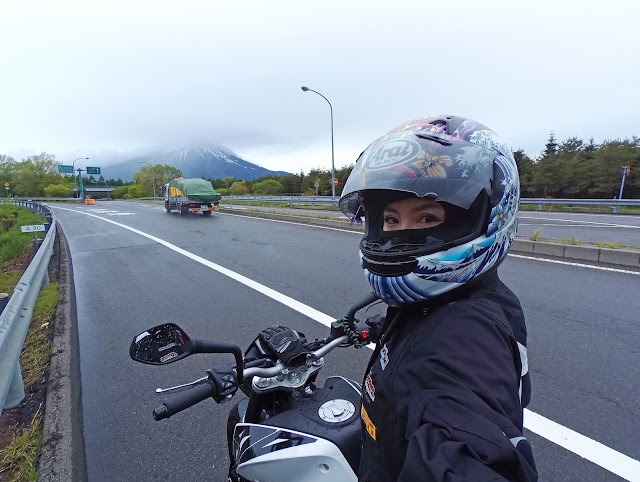 At least my day visiting the 5 Fuji Lakes didn't end on a gloomy note! The great thing about Japan is they have vending machines EVERYWHERE. LOL, from hot/cold drinks, to ciggies and snacks. Got a can of hot cocoa coffee to warm my hands, and here's to a magnificent view of Lake Motosuko! 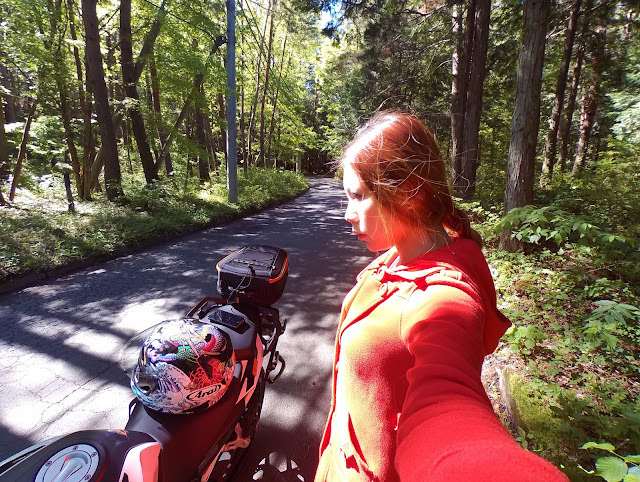 Time to head outta here, back to Kawaguchiko, before it gets too dark! 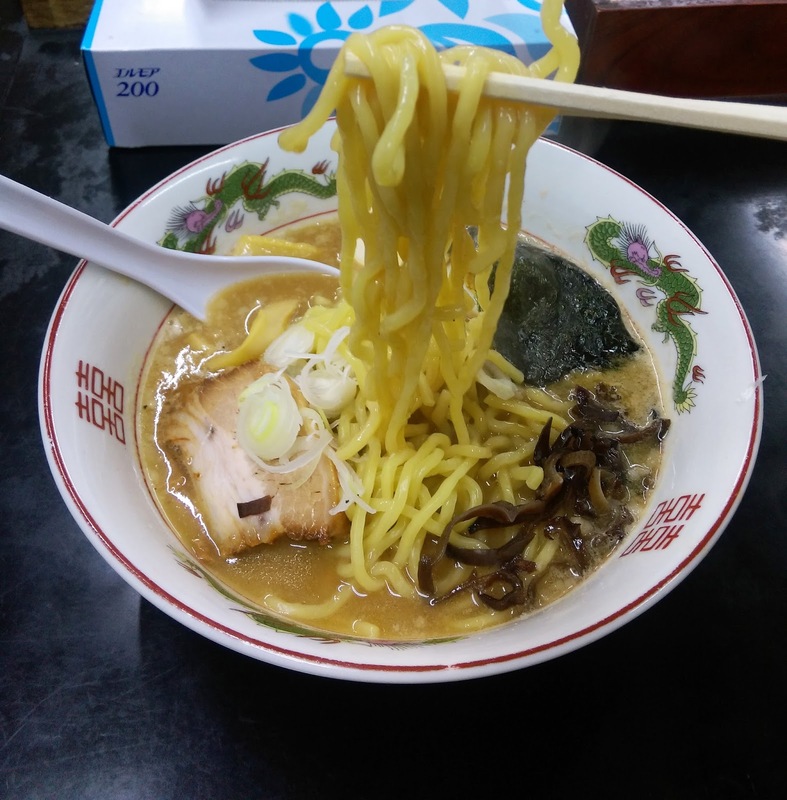 On the way back, I stopped by for a steaming hot bowl of ramen to warm my tummy as the current weather temperature here at night is pretty cold at 13°C. Let's hope tomorrow's weather will be better. These Tatamis are so cosyyyy, I could snuggle in all day. But! I opened my eyes and the clear blue skies were calling out! Japan convenience stores are seriously one of the best ever. They have almost everything! And the food there is nothing less than delicious. Grabbed my breakfast here, some yoghurt and bun, before heading out to hunt for Mt. Fuji! Here at Lake Kawaguchiko, one of the 5 Fuji Lakes that was located right behind Koe House. It has the longest shoreline, and is a major hub for those who plan to climb Mt. Fuji during the climbing seasons (July/August). Wow, the weather today is just AMAZING. Blue skies, cloudless, and perfect temperatures at 19°C! 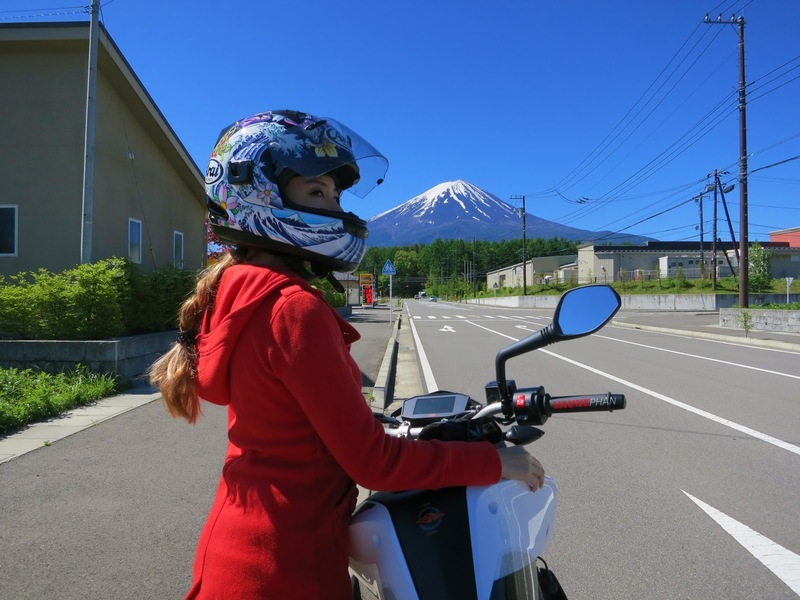 FINALLY, we see such a clear view of the majestic MOUNT FUJI!!! 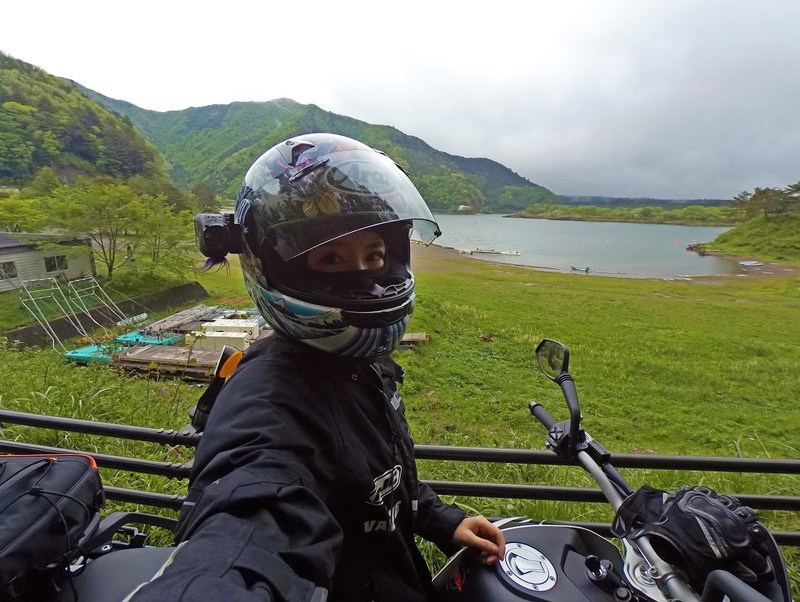 Biker Life: Pack some food along, ride around, find a great spot, and enjoy your meal with the best views of nature. Here's where I'm having my breakfast! 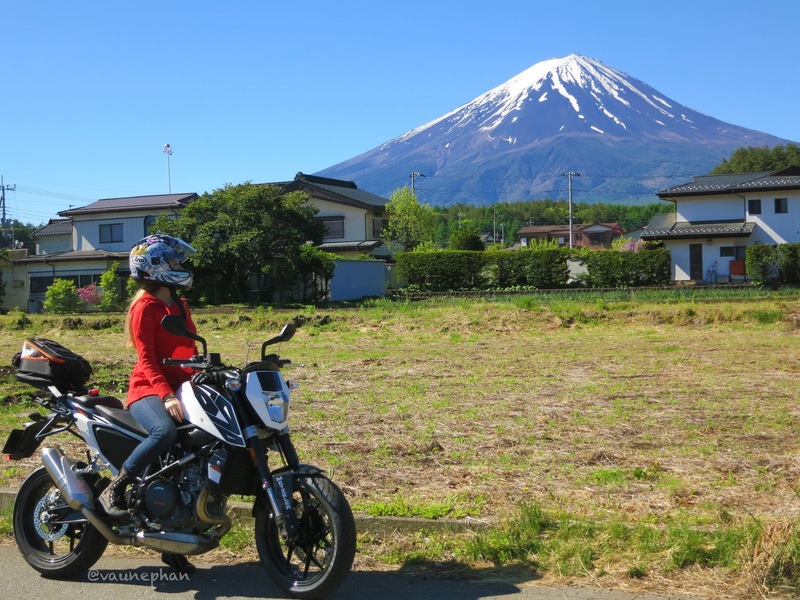 With such an incredible view of Japan's tallest volcano. Took my own sweet time to finish my breakkie. Let's try to find another spot to view Mt. Fuji. I rode towards the direction of Mt. Fuji and found myself lost in the woods, as usual haha. But the air here is so crisp and fresh! 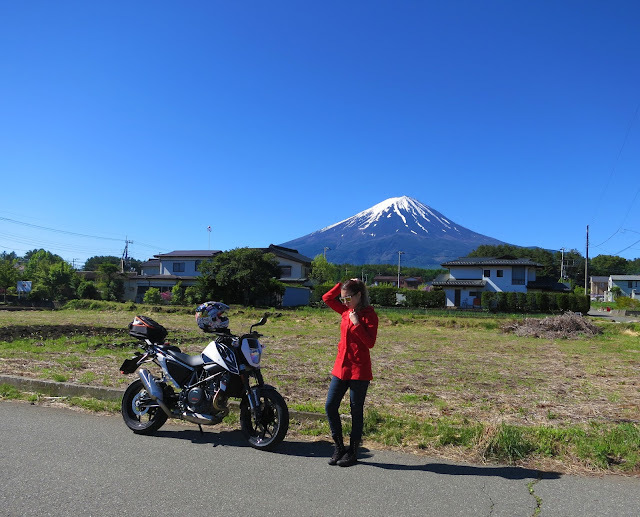 Rode through some residential area and found another unblocked view of the snow capped volcano. Hard to imagine it erupting.. It looks so graceful. Probably one of the prettiest volcano on Earth. The wonderful thing about Japan's most iconic volcano is that whichever angle you view it from, its still so beautiful and majestic looking. Argh.. I wish I could spend another day or two here, but it's time to head to Tokyo city because.. how can you not shop in Japan?? 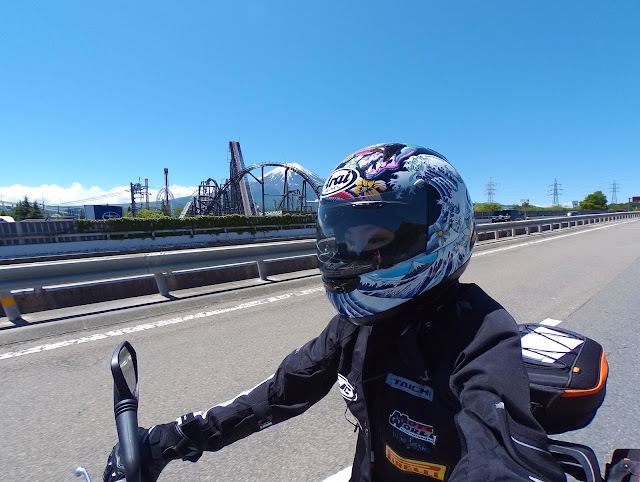 Passed by Fuji-Q Highland, Mt.Fuji's theme park with a Guinness World Record holding roller coaster of being one of the tallest in the world at 79m. Can't believe I actually rode on it 2 years ago when I was here. I remember screaming my lungs out. Riding a motorcycle is less straining to the heart... hehe. Ok so I hopped onto the highway where I traveled 150KM to Shibuya, Tokyo. 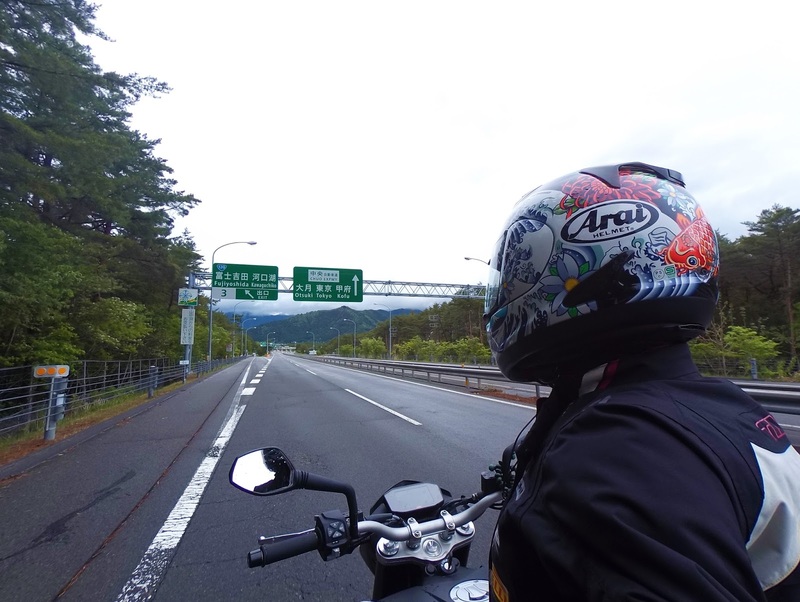 There was not much traffic until nearing the city, and the toll from Mt. Fuji to Tokyo cost about 3,800 Yen. 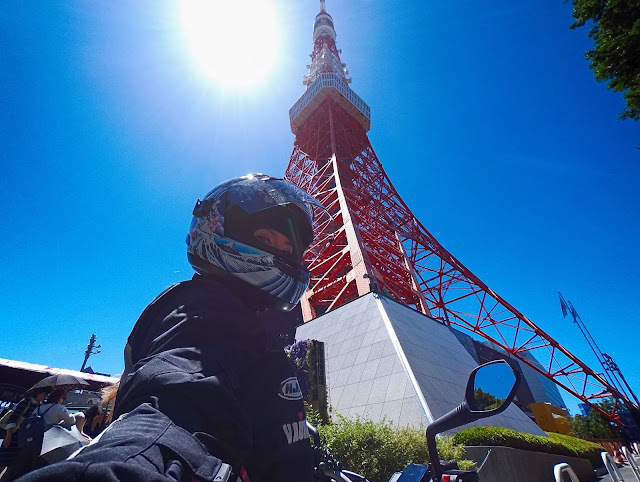 Before I knew it, I find myself right next to Tokyo Tower! It's the second-tallest structure in the whole of Japan, standing at 332.9metres. 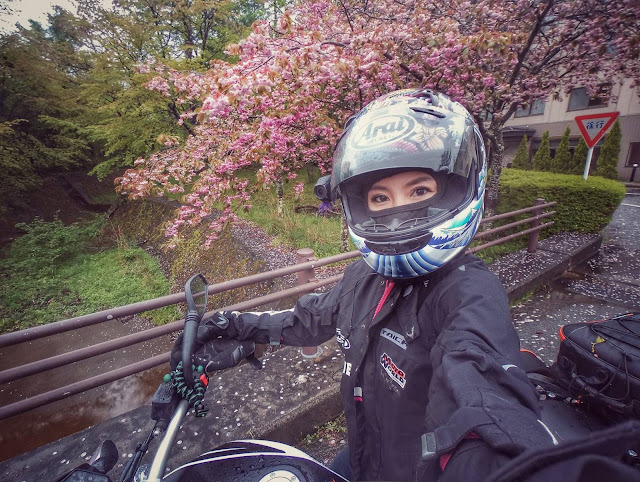 Say Hi to Japan's Traffic Police! Hurhur. 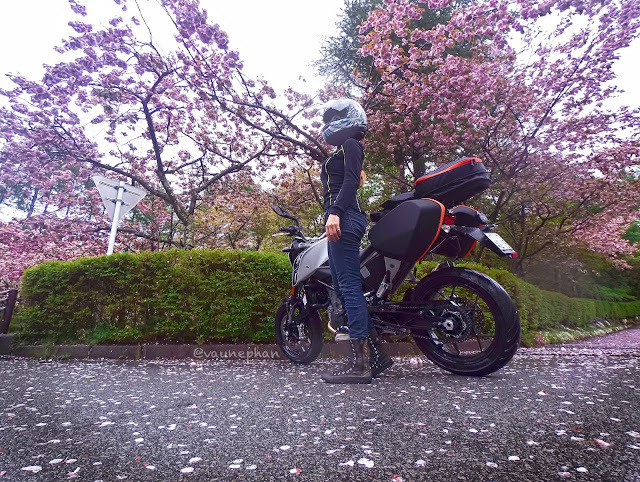 Dropped the KTM 690 Duke back to KTM Japan's shop, and headed off to Shibuya for some shopping! 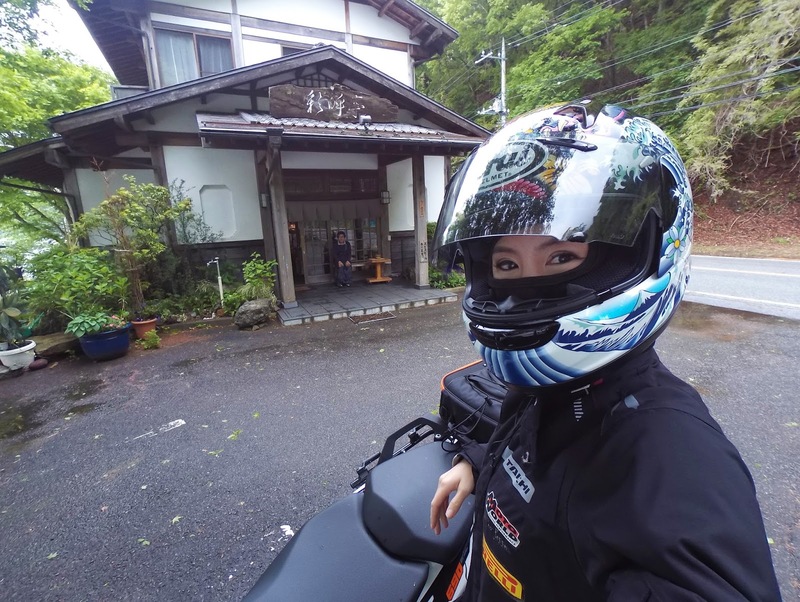 And that's how I spent two full days in Japan with and without a motorcycle! Thank you KTM Japan for the KTM 690 Duke which was such a friendly bike and with it fitted on with Metzeler's new grippy Roadtec 01, the ride never felt so reliable and comfortable. 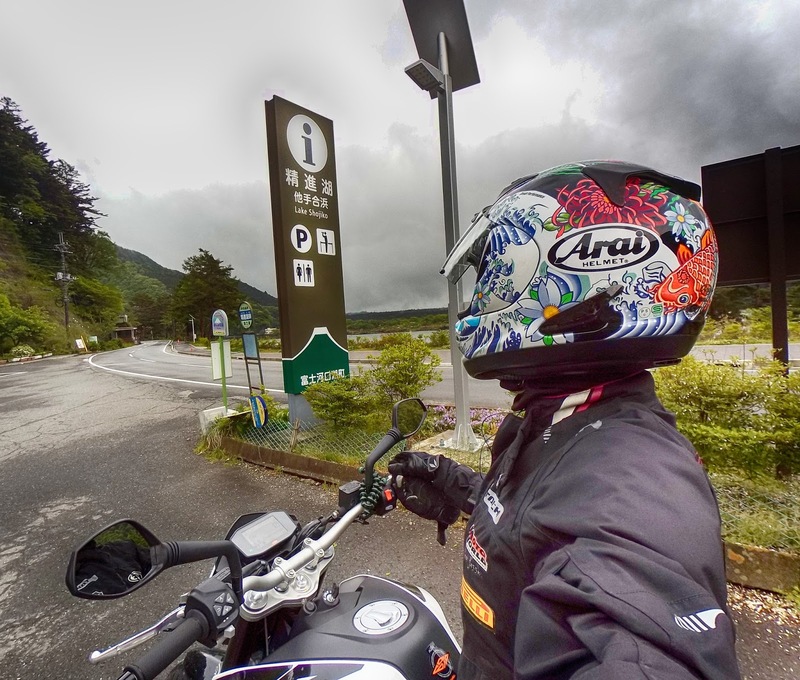 I'm already exploring other parts of Japan to ride in as I jetset off to Kuala Lumpur for FIM World Superbike Championship Race and.. my first track ride at Sepang after that! In case you don't know how to pronounce it, it sounds like "von". 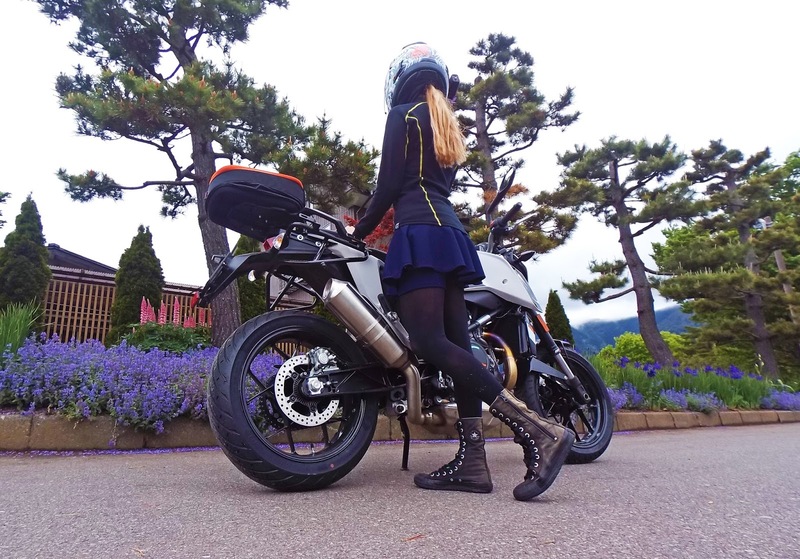 I love bike, beauty and things extraordinary. My life itself is filled with adventure and that bit of drama. Read on for your entertainment. 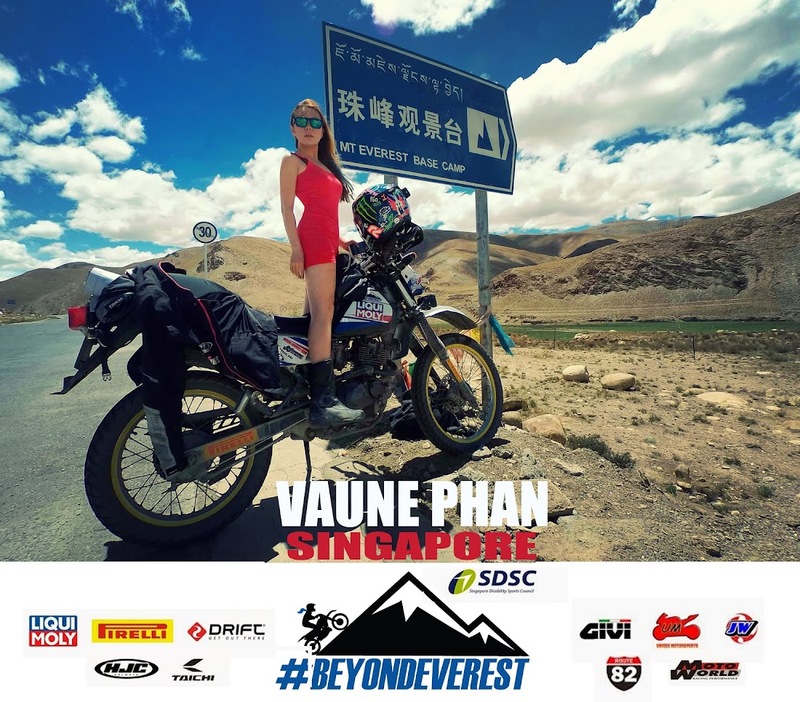 Vaune Phan: Who Am I?